People from all over New England flock to Cape Cod, Martha’s Vineyard, and Nantucket every summer, braving the crowds and tiptoeing around beach towels for a spot to enjoy sand and surf. What better reason, then, to visit the Cape and the Islands this fall? You get the same beautiful beaches, fine dining, quaint downtowns and championship golf courses without the crowds. Even better, you can enjoy an entirely different smorgasbord of activities. Here are a few perks of visiting your favorite summer destination after Labor Day. Hit Cape Cod in early fall, and it will still be warm enough to swim, surf and sun along Cape Cod National Seashore. Bonus: beach parking is free after Labor Day. 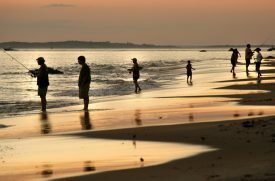 If you’re staying on Martha’s Vineyard, explore Moshup Beach, Joseph Sylvia State Beach or East Beach; on Nantucket, windsurfing is great on both Jetties Beach and Surfside Beach. Too chilly? Bring a sweater and a good book. The Cape and the Islands offer a bounty of delicious food come fall. Visit one of the many Farmers’ Markets to meet local growers and stock up on apples, pears, cranberries and other fall produce, as well as homemade breads and pies. When you’re ready for a meal, the Cape and the Islands will not disappoint. Enjoy fresh seafood by the waterfront, or warm up on a chilly day with clam chowder at a fireside tavern. For the best lobster rolls, ask around. Everyone has their favorite spot! For more culinary delights, plan your trip around one of the many fall food and wine festivals. Martha’s Vineyard Food and Wine Festival (October 17–21) features fine wines and cuisine from around the world. Wellfleet Oysterfest (October 13–15) celebrates the town’s famous oysters and shellfishing traditions. On Nantucket, try a new restaurant every night during Nantucket Restaurant Week (September 24–30). Meet the locals and celebrate the beginning of sweater weather at one of the area’s many fall festivals. Enjoy German music, beer gardens, kids’ crafts and bratwurst at Oktoberfest celebrations in both Mashpee (September 29) and Chatham (October 21). Also make time for the annual PumpkinFest at Sandwich Glass Museum (October 20). And celebrate all things cranberry at the Nantucket Cranberry Festival (October 6). The Nantucket Conservation Foundation’s Milestone Cranberry Bog sets the scene for this fun and educational fest, which features harvesting demos, samples of cranberry treats and music. What's your motivation to visit Cape Cod and the Islands this fall? Enjoy picturesque views from an entirely new angle when you explore the Cape and the Islands by kayak or paddleboard. Glide through tranquil waters, admire the scenery and scope out a spot to relax. 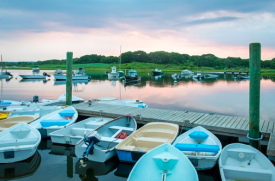 Nickerson State Park, Bass River and Town Cove are a few top kayaking spots around the Cape; Chatham Harbor and Washburn Island are great for paddleboarding. On Martha’s Vineyard, Felix Neck Wildlife Sanctuary offers wildlife tours by kayak, or take a sunrise, sunset or glow board paddle tour with Island Spirit Kayak. Nantucket Harbor is ideal for beginner kayakers, or paddleboard through Nantucket’s beautiful Salt Marsh Creeks to observe bird life. In the thick of summer, it’s often too hot and humid to spend a few hours away from the water. Fall, however, provides the ideal climate to explore the natural surroundings on foot or by bike. Admire fall foliage while strolling along one of the Cape’s more than 100 walking trails, passing by salt marshes, kettle ponds, cranberry bogs, bird sanctuaries and barrier beaches. To take in even more scenery, bring or rent a bike and explore miles of quiet roads, flat bike paths and mountain bike trails. On the Vineyard, autumn begs for long bike rides or walks on amazing hiking trails. Download the trail app and you’ll be on your way to all the hidden gems the Island has to offer. Trails of varying degrees of difficulty, most are dog-friendly, and many lead to beaches only accessible on foot. On two wheels, you’ve got 44 miles of flat bike trails to explore! Nantucket is unique in that almost half of its land is held in conservation trust, which means 32 miles of peaceful trails for the active traveler. Ready to plan your fall vacation? For more information on Cape Cod, visit CapeCodChamber.org. For more information on Martha’s Vineyard, visit MVY.com. For more information on Nantucket, visit NantucketChamber.org. This post is funded by the Massachusetts Office of Travel & Tourism.